While it seems like a good idea to base the framework on what people are functionally doing (and looking at the involvement of emotion could be good, too), I’ve got some issues with this post. For one thing, there’s a lot of wording I can’t understand, like when you say: “conscious experience of emotion in language”, “Each axis is a pair of opposites in terms of a characteristic associated with an action relative to the individual feeling the emotion”, the “assembly” of the reality we react to, “core” of emotion, “information that modifies the body component”, “social trust is a kind of consumptive process”, and “this is a thing that is natural and neutral in an abstract sense”. I have deeper concern for that wheel of emotions. It makes sense, when talking about anger, to say that the action (destruction or other negation of an obstacle) is partly motivated by the emotion. But for sadness, the “action” (loss of resources) is not motivated by the emotion. Rather, the emotion is in response to the loss of resources. The causation is reversed. So the logic of the wheel seems inconsistent and haphazard to me. Which isn’t good if it’s being used in the foundation of a framework. 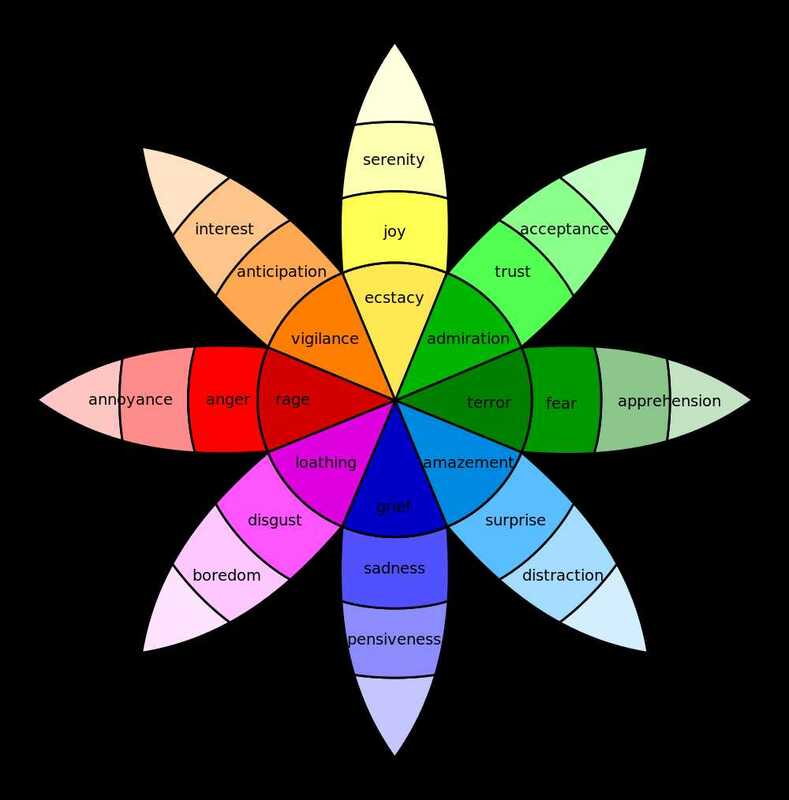 Also: why are those actions and emotions on the wheel, and not others? Why those “opposites”, and not other opposites? Isn’t the destructive action of anger more opposite to the support/nurturance of love or something? Isn’t craving the true opposite of disgust? A lot of it looks dubious to me. I looked at a citation from Wikipedia, but it just had a brief summary, not the full paper. Thank you for the reply. I apologize about the delay as real life has forced me to refrain from blogging. Good. Given that I’m discussing emotion from the perspective of a person on the end of a spectrum of human cognitive diversity I would be more surprised if no one had issues with things I posted. To be honest I was not happy with how I described many things in this post and one of the purposes of this post was “getting it out of my head” so I can make room for working on what was in there, and letting others give me what they think. Since it was introducing things I want to describe better and in more detail thank you for pointing out some of those things. Let me see if I can do better with some of this. 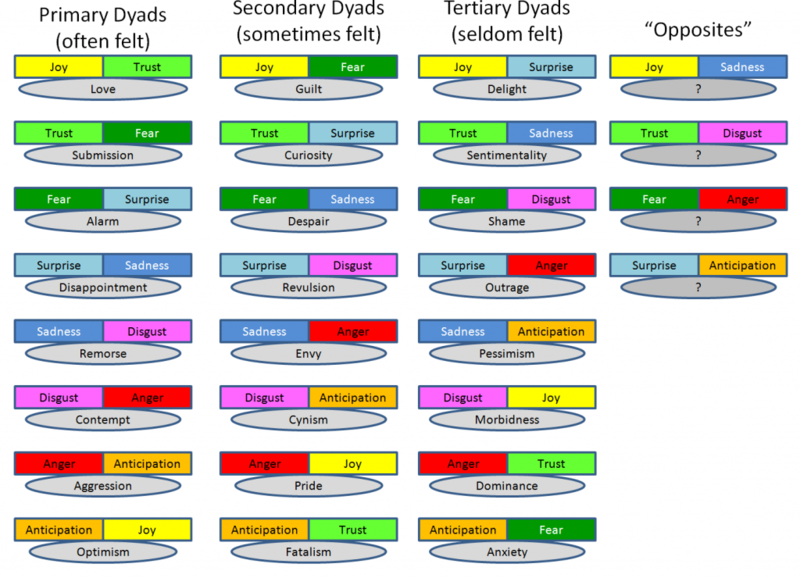 That is what I am building up to talking about, and one of the things I am anticipating is that the conscious experience of emotion in language is very diverse. In fact I’m not even assuming that I’ll see it the way that I do now after I write about it and have others look at it. What we call emotion seems to be more than one thing. According to the explanations that I prefer given what I have read so far it’s at least five things: feelings of body states, changes to memory, perception, thought, and actions to be taken with respect to what it is in perception. As individuals we don’t equally appreciate or identify these these these things as we communicate. Yet they are there like in someone that learns about fallacious reasoning in others and discovers how to sense and avoid it in oneself. 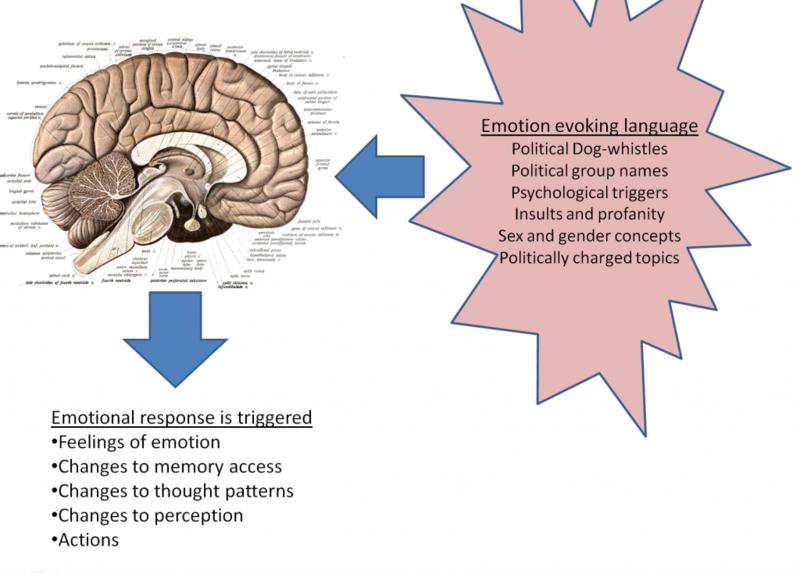 We react to communications and in those reactions there is cognitive machinery that drives selective memory access, reasoning and logic processes, perceptual choices (what to focus on and avoid/ignore in assessment that can be detected in responses) and more. I’m hoping that I can outline a picture of emotion that can be applied to language in a way that is useful to learn to “see” these “cognitive machines” in action. If nothing else I’m hoping I can outline something that gets at part of the picture that others can improve on since I only specialize in part of this on a basic human level. That one was pretty badly done. Consider square brackets “” to be something defined as an object. Also the precise nature of the axes is something I’m still thinking about. [characteristic associated with an action] = In the example axis of [surprise/anticipation] the characteristic with opposites is [unknown/known X] and the action is [interaction]. So surprise is a feeling having to do with interacting with an unknown and anticipation is the feeling associated with interacting with a known. In the [sadness/joy] axis it is opposite [change in number of resources]. For [disgust/trust] it is something like [expel/join with/from self], but I’m not completely happy with that. And for [fear/anger] it is something like [destroy obstacle/prevent destruction of self], but again I’m not completely happy with that as well. I see this more like something that it’s time to think about and work out instead of something where I have discovered what is going on. This has to do with there being a place in mental processes where “what/where” is locked into place and lets us think of things as objects. From there “how/why” determines what people do in response and why they do it. I think that it’s important to bring that up as a great meany things can be made into conceptual objects that evoke reactions and responses. The very presence of the felt component of emotion in language is treated as an object to be reacted to in dismissal of a person as being “too emotional”, as well as any objects that one side or the other is primarily interested in discussing or getting the other to discuss. I think that the way that many arguments break down into claims of being taken out of context has to do with people considering different objects as worthy of attention and emphasis (and ideally both sides are willing to consider the others most important object independent of any agreement). In the context that I used it it refers to the body forming the core of the data used in the generation of emotion. The brain stem nuclei that continuously map the body and it’s metabolic status are part of what is called the “primordial self” in Damasio’s book (which along with the “core self” and “autobiographical self” make up the self). When one feels a particular way about something one is literally experiencing a specific body state that is written to memory along with other information. 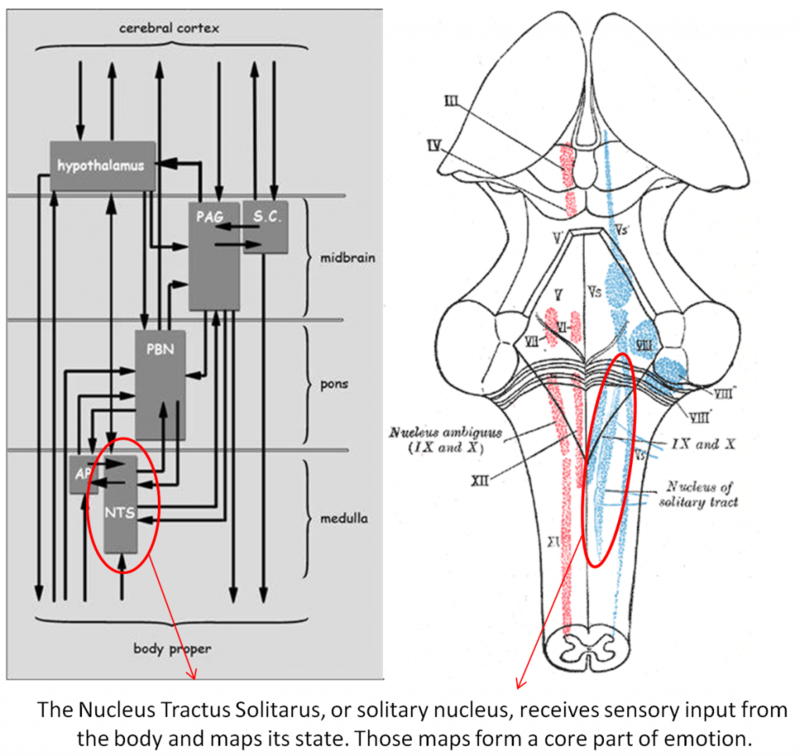 While one can argue that the connections with the outside world that modify these body states (the location of the “core self”) are just as important, perception is rooted in a perciever. I can see I’m going to have to be much more careful about how i describe this part. …and I can admit that this is one I thought about for a long time before typing it out. Eating and digesting seems the opposite of vomiting and at the social level social disgust is associated with the desired expulsion of people, behaviors, ways of thinking from one’s group. I have no problem with being wrong here, but I at least want a hypothetical computational basis for trust and trusting what one eats is conceptually extendable to trusting others like one self who will be helping one find food, just as ejecting something toxic one eats is conceptually extendable to doing the same for social elements. As an example of how I am using this, is hate good or bad? I think that it is neither and it is how hate is expressed that makes an expression of hate good or bad. I find it valuable to consider these things as neutrals at the species level in order to understand what they are and how they are used even as I combat manifestations of them in others contexts. I have deeper concern for that wheel of emotions. I’m sure that Plutchick’s way of looking at emotion will not be the last word and I have reservations of my own, particularly in how these emotions relate to one another (for example I think that fear underlies surprise, disgust, and anger in important ways). What I want is a starting point to talk about these issues. It makes sense, when talking about anger, to say that the action (destruction or other negation of an obstacle) is partly motivated by the emotion. But for sadness, the “action” (loss of resources) is not motivated by the emotion. Rather, the emotion is in response to the loss of resources. The causation is reversed. So the logic of the wheel seems inconsistent and haphazard to me. Which isn’t good if it’s being used in the foundation of a framework. No, the action IS PART OF THE EMOTION. I’m functionally synthesizing Plutchick’s theory with the research outlined in Damasio’s book into something else. Both anger and fear are responses to what is in perception, and past experiences provide the motivation for anger to be encoded instead of fear, joy, trust… We feel anger about an obstacle that can be destroyed, and we feel sadness at the loss of a resource. No, the action IS PART OF THE EMOTION. Right, I’m not using the special jargon. But I think there’s an actual inconsistency, not just semantics. Obviously “loss of resources” is item #1, while “attacking an obstacle” is all the way down at #5. “Loss of resources” is not “actions to be taken with respect to what it is in perception”, or “Actions that consist of responses to what we perceive”. But “destruction or other negation of an obstacle” is. We feel anger about an obstacle that can be destroyed, and we feel sadness at the loss of a resource. Yes, this is more consistent*. These are both step #1. Unlike the list in your blog post, which was haphazard, not consistent. You and John are turning out to be a pretty good critics, thank you for that. Many times when neurodiverse issues come up the issue of “expressive” vs. “impressive” (my word) comes up. For example in dysgraphia one can have problems with the understanding or expression of text. While I’m pretty good at the impressive part, I do have issues with the expressive part. I think that is one reason why I am as wordy as I am, I want to cover what I need and my command of symbols is worse in some areas while being better in others. Well, to be honest a big chunk of the things I want to address do involve semantics. A lot of social conflict and even the general attempts to understand the world better involve adding to what we know of reality such that the meaning associated with many objects like words changes. In the case of conflict many try to use one definition over another, or in the case of things like “SJW” as I see it the supposed meaning is not actually used most of the time, or in the case of “dictionary atheist” the word atheist and it’s meaning become a focus of conflict. I think the same thing happens with the word “emotion” and it’s related concepts. So if semantics get involved that would not be a problem either. I think I see what you mean now, thank you for expanding on that. I’m almost ready to try to do my next post and many of these issues have been in my mind because I was not sure how to put the things in this post together with a minimal picture of how we assemble reality in order to get at how we individually “grab onto” what we do in another person’s communication, it’s all very action oriented but there are places where I need to be able to identify areas where the action is more of a passive one. As I stated in my edit, an emotion is an “urge-to-action” and I think that sadness and it’s less and more intense counterparts do include an urge-to-action. In that case the urge is to try to recover or reconnect with what was lost. “Loss of resources” is not the best terminology (and I’ve been trying to come up with better terms) because of examples like the death of someone close. For many the experience of death is difficult because they can’t let go of the patterns of life that they are used to that included this other person. It’s hard to accept and many can’t function for a time as they try to get by and in a thousand little places they act like the person they were used to interacting with was still there, and then they remember. That is such an unpleasant experience that it’s possible that ideas of a place where the people they used to know now live exist became useful as a way of moving forward. At a less intense level when someone loses something there is a desire that it not be so. That the loss can be negated or reversed is the desire. A lost job. A lost belonging. A lost pet and many other things. I will need to make sure that I create clear descriptions of the urge-to-action that is associated with each basic emotion. Though that extra specification, “that can be destroyed”, might not be necessary. If there are any obstacles that cannot be destroyed, people still might get angry about them, and even fruitlessly attempt to destroy the obstacle. I think that it is important, but I also include “negated” because I see these things as a spectrum and anger is basically like a “make it go away”. So in that respect a smaller, implicit, and maybe even unconscious version of anger would be a source of the need to demonstrate that something is wrong in a discussion that was not otherwise passionate for the people involved. The urge to destroy or negate is the important part and the realization that the thing can not be destroyed would combine with another emotional state and form a more complex dyad. For example anger and sadness forming envy because one can not simply gain what one perceives for various reasons. I hope that is better. Thank you for taking the time to do this. Also the internet is real life. That is one response to what I perceive that I am still working on changing.